Sorry there are so many 3's - I don't like to judge anyone, fictional or not, on so little information Hope I helped (and I really don't want rep for this - keep it for a more deserving post), and good luck! Read the statement that describes Matt and then answer 14 questions rating 1-5 towards the nearest description. 2 and 4 leaning to one term. 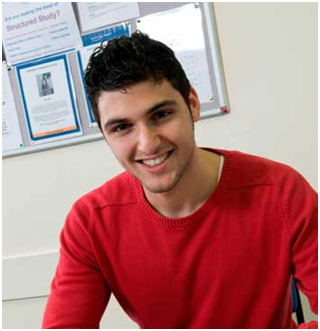 The picture above shows Matt, he is 20 years old and is an undergraduate student studying Chemistry. Matt likes to play video games on his Xbox 360 and download his favourite films and television shows to watch on his laptop. He used to weigh 18 stone but now maintains a healthy weight. When Matt graduates he plans to go travelling. Not on the scale chart, but good luck! 1. -4- , towards industrious due to losing weight, travelling plans but not fully cuz of xbox etc. 2. -3- Will power because of losing weight, but gaming etc may show lack of commitment to work sometimes? 3. -4- . As a guy i think i can state he is a little above average, thus 4. 5. -4- didn't really get 'slow or fast' .. but give his drive to go travelling and past weight loss, fast just springs to mind more. 7. -2- . Slightly towards inactive, just judging by small amount of information given. 8. -3-. Playing games and watching tv too much (as most people do anyway) may contribute to a 'weaker' mind i guess? 10. -1- . Likes food, i imagine through being 'over weight' he liked food, a good diet and such to maintain a healthy weight must show a certain 'like' of food but in a different way. 11. -5- He is hardly 'shapeless' if we are using this term in the way i think we are :L . He is not fat, by any means though. 12. -3- Mainting a healthy weight tells me he knows what weight he is, and thus sticks to it. This leads me to assume he eats a correct amoutn of food for what effort he puts out. 13. -4- I#d say he is secure, losing weight and getting fitter will do that. But a slight remament of insecurity may still be there. 14. -4- Same reason as above really. Didn't really understand Q5. Is that as in running, or mentally? I am looking forward to rep.
That's fair enough haha. Like i said i was basically thinking about it really quick and typing quick cuz i was in the middle of some revision :L . Good luck with it.